Your investment in Liberian Youth teaches them marketable skills and prepares them to be ready for any opportunity that comes their way. As you have witnessed, our students work diligently in perfecting their craft, and through your continued support, they are able to advance their skills with real experience. One of our sustaining supporters, Joel Decker of Starland Charities in Minnesota, donated $350 to purchase the advanced learning materials for our electrician students and four ceiling fans for our center to help improve the learning environment. Joel fulfilled a wish expressed by our electrician students during the general meeting on September 29, when they requested supplies to learn how to install three-phase power for commercial buildings. The instructor, Boakai Dillon, started working with the students the day the supplies were purchased. 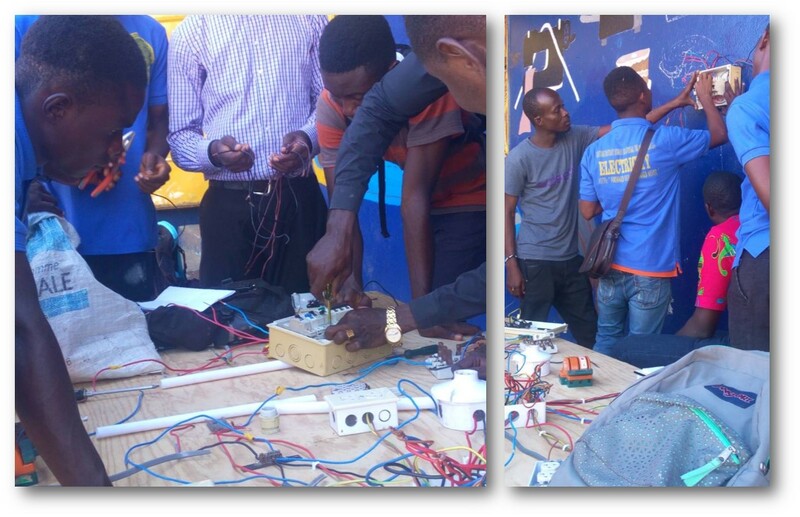 Our students practiced how to connect three-phase and how to add the different type of breakers to the control box. 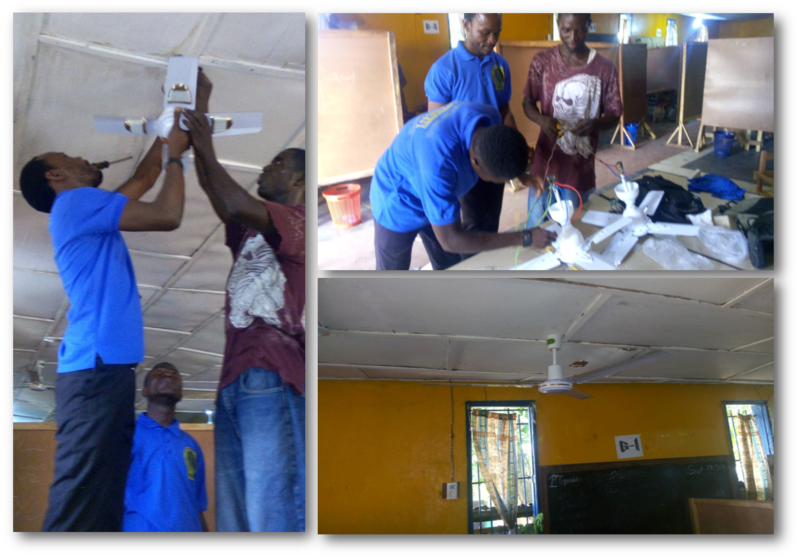 This simple act of kindness by Joel helps our electrician students take their skill training to a higher level. Our students also received the opportunity to install the our ceiling fans in the great room of our center and connecting them to the breaker. The electrician students received real experience, and all students will benefit from a comfortable learning environment with the onset of hotter temperatures from the dry season. Your commitment to young men and women allows them to hit the ground running after graduation. They are prepared to adapt to any type of work environment with the foundation of skills in their given trade. Your support is essential to their future success. Thank you, Joel, for fulfilling the wishes of our electrician students! This entry was posted in Africa, education, Electrician Course, electricity course, Liberia, Real Experience, Students, Sustainable Training, Trade School, vocational training, Youth, youth development, Youth Empowerment, Youth Leadership and tagged Africa, Electrician, Liberia, Liberian, Minnesota, NGO, Real Experience, trade school, TVET, Vocational Training, Youth Development, Youth Empowerment. Bookmark the permalink.